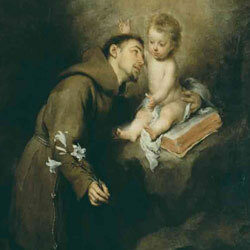 The image most associated with St. Anthony is that of a young friar holding the Baby Jesus and a lily. There are, however, other symbols associated with him, such as the bread or the book. Let us look at their meaning. 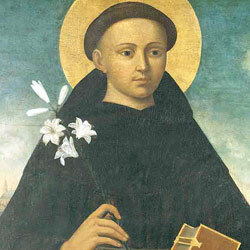 The lily represents his purity and his lifelong struggle against the devil. The Christ Child (or Baby Jesus) recalls his vision at Camposampiero. It also highlights his love for the humanity of Christ and his intimacy with God. His young age recalls his idealistic, pure and good character, which welcomed everyone. Bread recalls the Saint’s charity towards the poor. 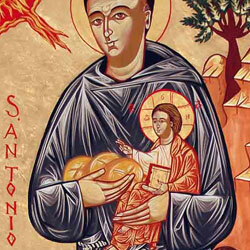 This image is obviously connected with the work "Bread for the poor of St. Anthony", an initiative which is always alive and active. 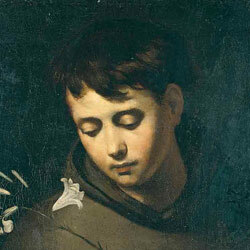 The image is also linked to Caritas Antoniana (St Anthony’s Charities), an organisation which brings the Saint’s solidarity throughout the world. 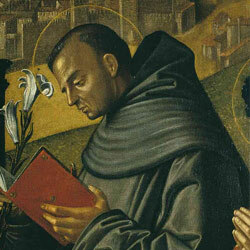 The oldest image, and the one which is closest to historical reality, is that of the Saint with a book in his hand. The book symbolises his knowledge, his teaching and his preaching, which were always inspired by the book “par excellence”: the Bible. 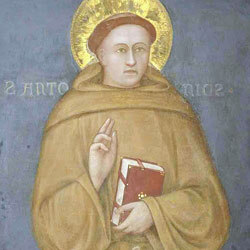 The Franciscan habit (brown or black) recalls his membership of the Franciscan order. 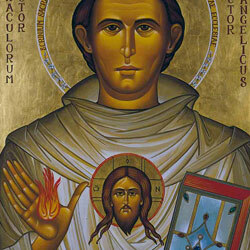 Sometimes the Saint is represented with a flame in his hand, which highlights his love for God and humanity.